David Gostick enters his seventh season on the podium with PCU. In that time the choir has been praised for its warm sound and engaging performances. David also conducts the Bournemouth Sinfonietta Choir, which has a strong reputation for the remarkable range of their repertoire. This season he takes over the helm at the Bath Choral Society, noted for their two annual performances of Messiah in Bath Abbey. He is Director of Music at Wimborne Minster, producing cathedral-style music in this historic church, and regularly conducts the Medici Choir and Brandenburg Sinfonia. Ian Richardson is an accompanist, organist and teacher, active both in the fields of performance and education. 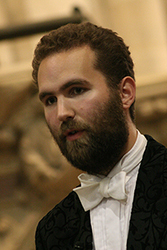 He is Assistant Musical Director and Accompanist to the Portsmouth Choral Union, and an examiner for the ABRSM. By day, Ian is Assistant Director of Music and House Master at The Prebendal School, Chichester. He has previously worked as an exam pianist at Southampton University Music Department, and is an organist at St John's Catholic Cathedral in Portsmouth.